Thinking about a unique weekend getaway? You should think about visiting Shipshewana, Indiana. 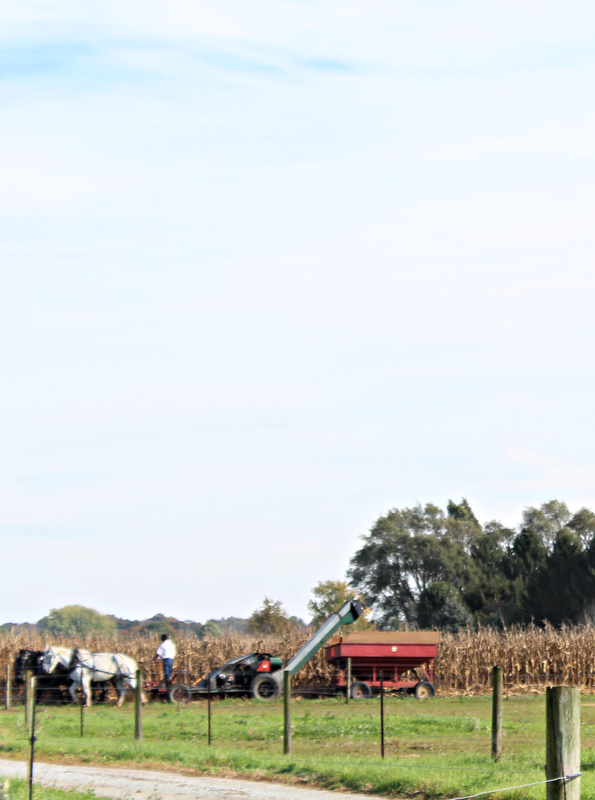 It’s home to one of the largest Amish communities in the nation. Read below to learn more about my overnight experience! As I mentioned a while back, Anika and I traveled this past fall to Indianapolis so her group could compete in the National FFA Convention. A combination group of 29 students and chaperones traveled from Oregon, flew into Chicago, and the approximately four-hour trip down to Indianapolis. Along the way we made a very unique overnight stop in a place where life is just a little different from what many of us are used too. We stayed in a community where buggies outnumber cars and everywhere you look homes and landscapes are immaculately kept. Life is great. You know what makes it even better? A weekend getaway. Or road trips where you can get away for any two days of the week. There’s no rule that says you have to go from a Friday-Sunday to have fun. I love the concept of running away for a couple of days to a place that a.) I’ve never been to, or b.) a place that I’ve always wanted to spend a little more time at. Perhaps the best thing about road trips is that you call the shots. You decide who you are going with, if you are traveling by car, train, or plane, how cheap (or extravagant!) you’ll be, and how many activities you’ll participate in. The concept of a weekend road trip is simple: to get a quick break and rejuvenate yourself so that you can tackle anything the next week brings. While I believe that weekend road trips shouldn’t take up too much time planning, there are a few things that you should have figured out ahead of time, like, you know, sleeping accommodations to say the very least. You want to plan just enough so that you’re not left stressed out last-minute but not so much that you don’t have the opportunity to explore, because sometimes when things are spontaneous the best memories are made. Southern Oregon. My old stomping grounds. As I shared a few months ago, I returned to the area of my childhood back in September for a pre-Feast tour with Travel Oregon. We stayed in the small town of Jacksonville as well as Ashland – experiencing areas that I hadn’t had the opportunity to explore much of. I wrote all about Jacksonville before – you can catch up about that HERE. Ashland, Oregon is only about a 15 miles from the California border. Ashland is very much a college town, as it is the home of Southern Oregon University. However, it is also a blossoming cultural area for families as well. There are numerous downtown shops, hiking trails, and other nearby activities that make Ashland a fun place to visit. Last month when we were in San Francisco exploring, we had the opportunity to go on an evening sail courtesy of Adventure Cat Sailing Charters. Adventure Cat Sailing took over 40,000 passengers on their tours last year, and I quickly saw why it was so popular. What better way to get views of the water, Alcatraz Island, and the Golden Gate Bridge other than sailing by them? The sail was 90 minutes long and included a small snack buffet and two beverages ( with additional available for purchase). There were jackets available for those who needed a little extra warmth, and a warm cabin just in case it got a little chilly outside. We lucked out and had a gorgeous evening with a beautiful sunset – which lit up beautifully behind the Golden Gate Bridge as we sailed underneath of it. Crew members gladly assisted in photo taking for the memorable moment and were very friendly and helpful during the entire sail. We recently visited San Francisco for the first time. It’s a place that I’ve always wanted to visit, and living in Oregon it’s a quick flight down there. Wayne and I spent two nights there for our anniversary. We left early on a Monday morning and returned back in Portland late Wednesday evening. I spent quite a bit of time planning it all out – checking out hotels, activities, restaurants, and transportation. Many people advised to take advantage of the public transportation options that San Francisco offered because they were easy to use and affordable. We decided to give it a try.